Constant Watt - precise and constant temperature output regardless of ambient and surface temperatures. 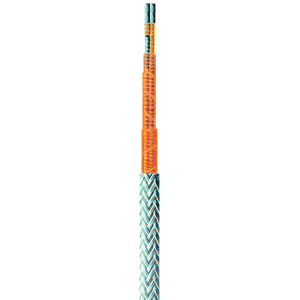 Ideal heating cable for long run applications. Extreme flexibility construction: Thin profile construction with tinned copper over braid. Easily installed around most piping and equipment. Can be cut-to-length and terminated at the job site. Approvals for ordinary and hazardous area environments. Approval valid only when used with appropriate heating cable and installation accessories, and installed in accordance with all applicable instructions, codes, and regulations. Constant-Wattage cable uses a fixed resistance wire wrapped around two main conductors (bus wires). At specific intervals the insulation is removed from the bus wires, forming the Contact Module Points. These Contact Module Points are staggered along the length of the cable. This creates consistent heating circuits known as the Module Length. When power is applied to the bus wires each complete Module Length heats at the rated wattage output. The incomplete Module Lengths, at the beginning and end of each cable, do not heat. This allows the “Cold” ends to be safely placed inside of a controller or junction box. Note: when ordering, please allow a minimum of 1 module length extra for terminations. Do I need a temperature controller with Constant Wattage Heating Tape? Yes - BriskHeat Constant Wattage Cable should be used with an appropriate temperature controller. What is the maximum bending radius of constant wattage cable? The maximum bend radius for our constant wattage cable is 1” (25 mm). How do I terminate Constant Wattage Heating Cable? BriskHeat offers kits that include the required termination products.